Focus on Faith: GET UP, STAND UP: STAND UP FOR YOUR RIGHTS! Bob Marley summoned, as it were, and the people of Tunisia and Egypt have answered. They revolted and spoke unequivocally in one voice: we are tired of this nonsense; get out! Tunisian President Zine al-Abidine Ben Ali had respected the iron fist of people’s power. But haughty, deeply unpopular Egypt’s Hosni Mubarak is still lukewarm. In their wake they still have the people of Syria, Jordan and Yemen warming up to kick out the despots ruling their lands. The masses were able to see themselves as human beings with rights to free speech and assembly; defying police brutality and the intimidation of the oppressors who call themselves leaders. What was unthinkable of happening an hour ago was suddenly, not only possible, it was so common amidst the aggrieved multitude that even the protestors were marvelled at the feat. Calling the names of tyrants in the open and describing them with fitting, appropriate adjectives, without minding the presence of both uniformed and plain clothed security personnel. In Egypt for instance, you could not complain of apparent injustice even in private, for you don’t know whether or not your house was wired by the secret, undercover police. Then suddenly, an inspiration came from Tunisia with a clear import: popular uprising, persistent and determined confrontation with the instrument of oppression of the state will bring down froward potentates! Get up, stand up: stand up for your rights! Don’t give up the fight…. Unfortunately, members of the police force, who are said to be our friends, keeping law and order, are used in many places around the world to send terror into the hearts of common people who desire to express their rights to decent life and lawful assembly. 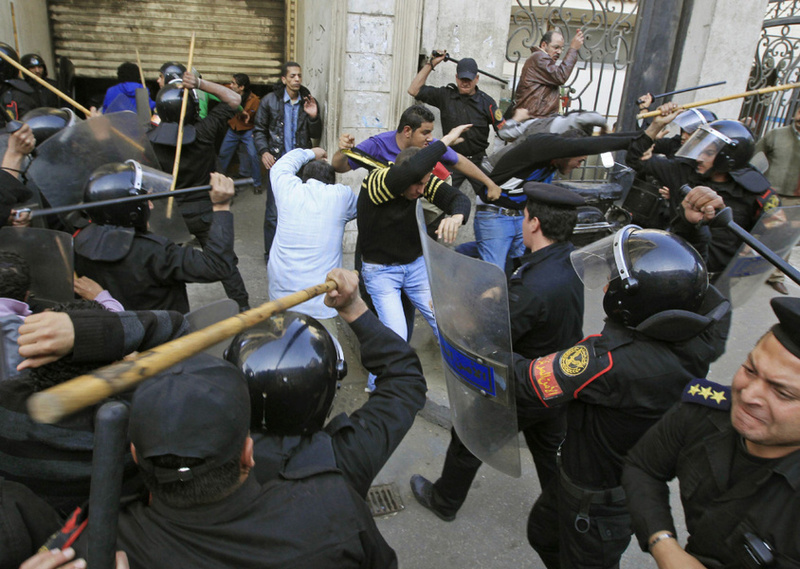 In both Tunisia and Egypt we saw police brutality at its peak; unlawfully arresting, beating, detaining, running over unarmed civilians with police vans, and killing hundreds of protestors with live ammunition. Most of the bodies were riddled with bullets. I would prefer an enemy than have perpetrators of these crimes as friends! The Egyptians chose a place in the heart of the capital for their demonstrations: Tahrir Square, Cairo (and in other places like Mahalla, Alexandria, Mansoura, Suez and Luxor). Tahrir actually means Liberation in Arabic. They have been gathering there every day in hundreds of thousands not minding the deafening sounds of helicopters and F15 military fighter jets hovering so low above them; a desperate attempt by Mubarak to scare them away from the Liberation Square. They did not budge! What started with hundreds of thousand protestors culminated into a real, genuine ‘Million Man March’; not the fake, made in Nigeria Million Man March orchestrated here by some rascals in government to fool us. No, that of Egypt was real; a spontaneous response of the oppressed. The protestors succeeded in exceeding their target of a million people to over two million. They kept chanting the slogans and words of freedom, urging themselves on, telling the dictator to go. Placards in both Arabic and English read: Go Mubarak. You are done; just leave! No religious symbols displayed; no political differences pronounced; no party flags; only one flag was fluttering – the Egyptian National Flag - everybody was chanting in unison: down with Mubarak! Aljazeera satellite television reported that during the Friday prayers of 28th January, 2011 Egyptian Christians formed human barricade around Muslim congregations offering their salaah on the streets! Nothing truly unites like a common goal! They set aside petty tyranny and strife to face a common enemy that has subjugated and dehumanised them for about three decades. America should come to terms with the reality of events in Cairo. The era of supporting despotic leaders in the region is over. The excuse that the stability of a region is worth sacrificing the people’s rights to a leader of their choice is not only dishonest and immoral, it is irresponsible! The events surrounding the Iranian revolution; the futility of relying on and supporting one person against an entire nation should be fresh on the mind of America. Urging Mubarak to reform, which he’s been averting for 30 years, calling on him to have ‘a peaceful dialogue’, is meaningless. (Secretary of State), Clinton’s call for the establishment of real ‘democracy’ and an ‘orderly transition’ in Egypt is laughable and has shown the double standard and hypocrisy in U.S foreign policy. Why has America been dealing with people like Mubarak if it knew all along that they were undemocratic? They invade one nation on the one excuse that it is a despotic and undemocratic regime only to court and befriend another with even worse credentials. Obama could make America popular once more in the region by intervening, encouraging the coming into being of a new government through a free and fair election to be conducted by an interim authority. Sacking members of the old cabinet by Mubarak, changing them with another set of lackeys, , orchestrating clashes between sponsored pro-Mubarak supporters against anti-Mubarak protesters, and blocking internet access, shutting down satellite television and mobile telephone networks will not help his falling regime. Mubarak and despots of his ilk have not been serving their people. Why is America afraid of democracy in the region? Why is Israel supporting Mubarak and wanting to maintain the status quo? If the majority having its way is what democracy is all about, why is this fear of certain groups establishing governments in the region? Algeria has been ruled by one party, the National Liberation Front (FLN), since independence. In June 1990, the Islamic Salvation Front (FIS) won by large margins in local elections. “The outcome was more a massive no-confidence vote against the corrupt, incompetent, and self-satisfied secular establishment than an endorsement of an Islamic republic.” In legislative elections in December 1991, the FIS wins again. They seem poised to win a runoff election one month later that would put them in power. But on January 11, 1992, the army stages a coup, with America’s covert support, overthrowing President Chadli Benjedid and cancelling the runoff elections. Within months, the FIS was banned, its local officials elected in 1990 were removed from office, and tens of thousands of suspected sympathizers imprisoned and often tortured. Palestinians weren't happy "with the status quo" during the elections of 2006; thus they voted Hamas overwhelmingly. Hamas was the victorious party in the elections, defeating Fatah, the ruling secular party of Yasser Arafat and his successor, Mahmoud Abbas. The people of Palestine voted for Hamas because they were fed-up with the corruption and inefficiency of the PA. But America and Israel refused to recognise the Hamas government that came to power through the democratic process that they profess and trumpet. Their reasons? Hamas is a “terrorist”… ‘Islamist, anti-West, anti-Israel, anti-United States, terror-promoting’ organization! Now one would wonder; if the people of a sovereign state want a “terrorist” government, and vote for it democratically, what is anyone’s business with that? Muslims and Christians in Nigeria could borrow a leaf from the unity of purpose exhibited by the Egyptians and the Tunisians. The warring factions in Jos, the Plateau State capital, should stop killing themselves; they should confront a chief security officer who is bent on fanning the embers of religious unrest for his personal gains. The real adversary of religious harmony is not your Muslim or Christian brethren, but your chief executive! Why will you then add to your sorrow by killing and maiming the innocent? The army should also clean its stables if the reports that soldiers are also exhibiting partisanship are anything to believe. There is a relationship between Tunisia and Egypt – both are Arabic speaking, with Muslim majority, and have been under a dictatorship for long. There is also this submissiveness on the part of the Arab Muslim to legitimate or otherwise leaders. This docility emanated from the exhortations of Muslim scholars that are often times close to power. Rehearsing the oft-repeated hadeeth enjoining us not to confront our rulers provided they pray in our midst. The current happenings had sent clear challenge to such scholars to come up with an interpretation of that tradition in line with prevailing realities. I have seen many Muslim scholars among the protestors in the two uprisings under discussion. Also, women in full hijab have participated in the demonstrations. The situation is the same in Nigeria. Like the Arabs, Nigerians have within their various ethnic groups this culture of respect and submission to authority. The Church and the Mosque have not helped matters either. The overseers of our congregations in these places of worship will admonish us to pray for the wellbeing of our leaders. They hardly preach against corrupt practices, graft or misrule. So, this omission and our inherent nature of respecting those among us in authority made us so docile that the intellectually challenged could lord it over us, steal our commonwealth and even vote on our behalf. Is our condition in Nigeria, by the way, any better than that of the countries we are discussing in this piece? I think we are worse off. If these demonstrations were in Nigeria, Power Holding Company would have made sure that we remain in darkness acting on ‘orders from above’. People, whom we did not elect, parade themselves as our elected representatives, squander 25% of our annual budget under the pseudonym of emoluments and other allowances – (thanks to CBN Governor’s exposé); another set embezzles a whopping 50% as executive expenditure, whatever that means. As if that is not enough, this gang has now vowed to continue rigging elections and ruling us against our wish for the next 50 years so that we all can chant: ‘Power to the People’! They are not concerned, thus, with the state of our health facilities or the condition of our schools. Their tourism to other climes would take care of their medical needs, while their progenies study in famous institutions oversees. And some clergy, out of touch with current realities, would admonish good prayers and obedience to ‘constituted authority’. We hear and we disobey! If we had but harkened to Bob Marley, (not to the track but the import of the lyrics), hardly would anyone be able to take us for a long ride. If we had marched peacefully but persistently to our own Tahrir Square after the robbery of our mandate in 2003 and 2007, this subsisting quagmire would have been averted. i agree with you but remember the imam & pastor's most come out & tell the political leaders especially the president & the governors of what they re doing. betrayal of trust,like of sincerity that lead to the lost of confidence to representative. i think we re Nigerian's & we knew where the problems are as we are approaching governorship election, we understand that governors are the captains in the process of rigging why not changing them & bring decent people & parties that will allow thinks to go right in this country.